3 Kinds of Minds - Which one is Yours? - Something New Everyday! Home wisdom 3 Kinds of Minds - Which one is Yours? 3 Kinds of Minds - Which one is Yours? Great minds discuss ideas, literature, purely intellectual theories, social laws, education systems, and citizen's attitudes. 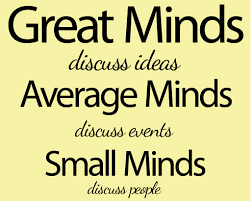 Average minds discuss events, Strikes, demonstrations, and if they had more time for discussion they should probably have made a great many more mistakes. Small minds discuss trifle matters… Everything is open to discussion, People's talks, he/she said… And as a conclusion life is death. Which mind do you possess currently? Remember: Great Minds achieve more, stress less and enjoy life. How Strange It Is !! !